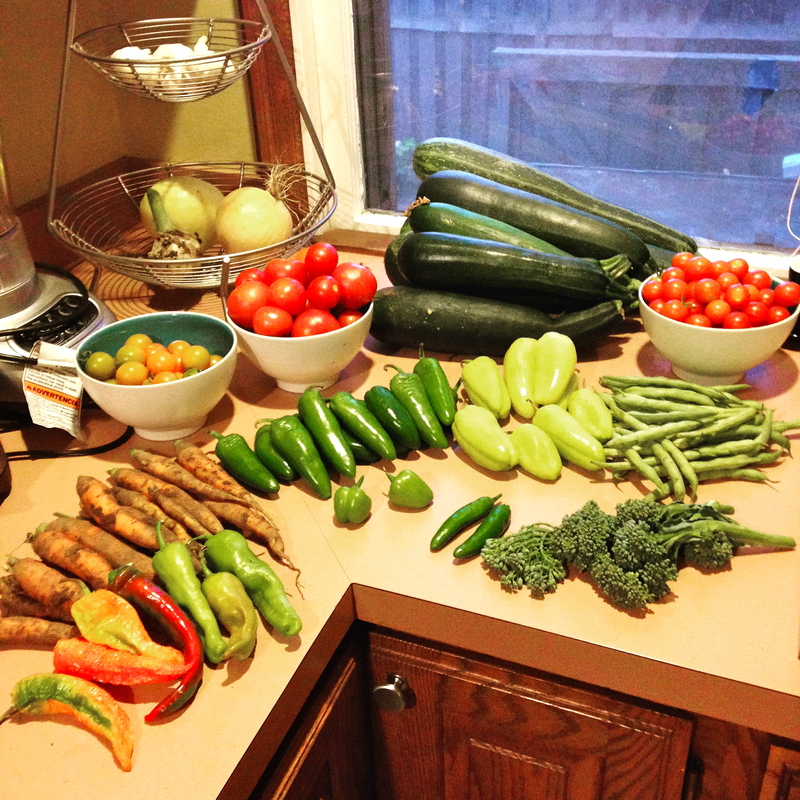 Between my back yard garden (which is something I always longed to have while living in Chicago), my brother’s HUGE garden plot at work (he works on a farm), and some scores from my local farmers market, I have been working through the first of the summer’s bounty. 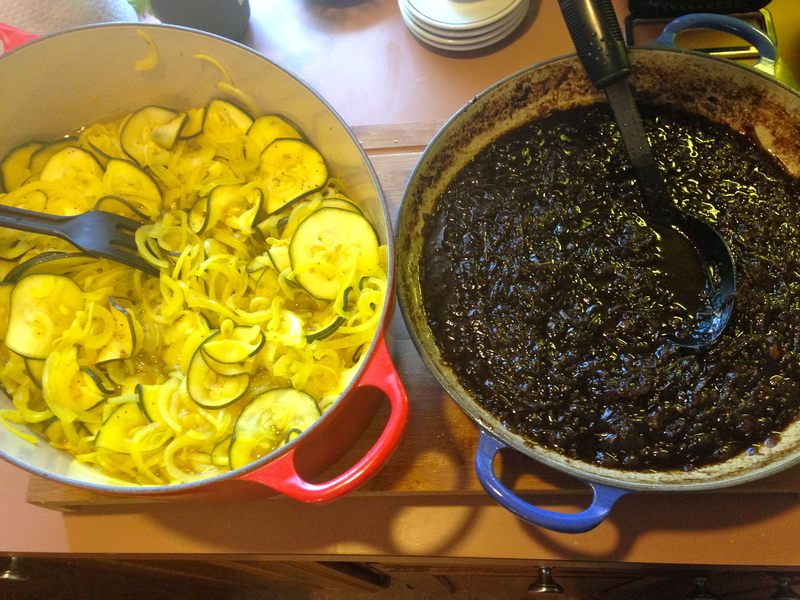 Not pictured: 8 lbs of pickling cucumbers. 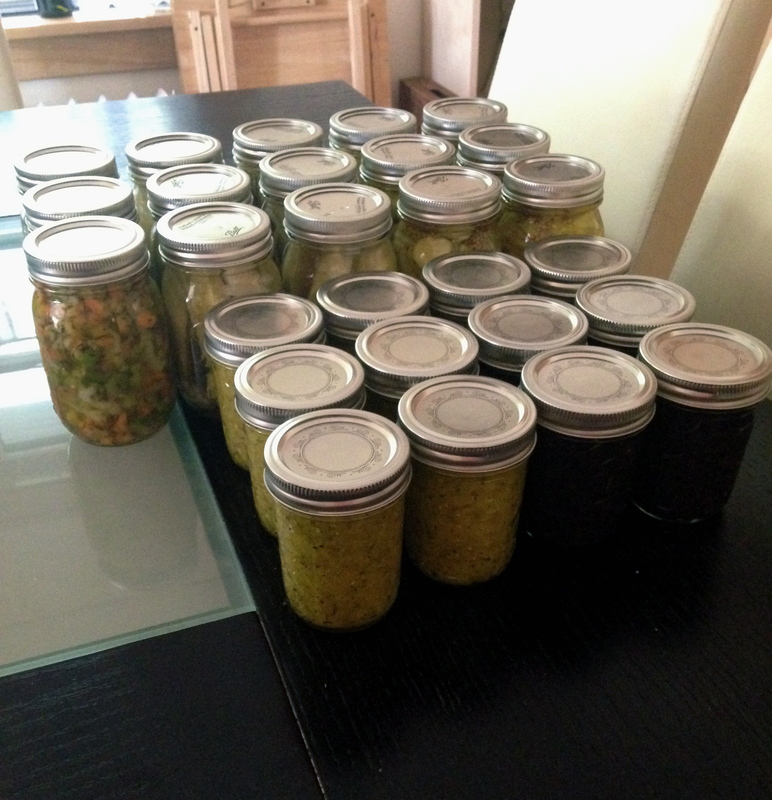 I had this week off of work, so I had plenty of time to spend planning, cooking, freezing and canning. This truly was so much fun for me to work through. The kitchen is my happy place! I am not going to go into great detail of everything I did, but will touch on the highlights of how I used a variety of these ingredients. I found most of my recipes online, so I will include links for anyone else that may be looking for ideas. After a morning of finding recipes, planning a shopping list and going grocery shopping, I needed some lunch. 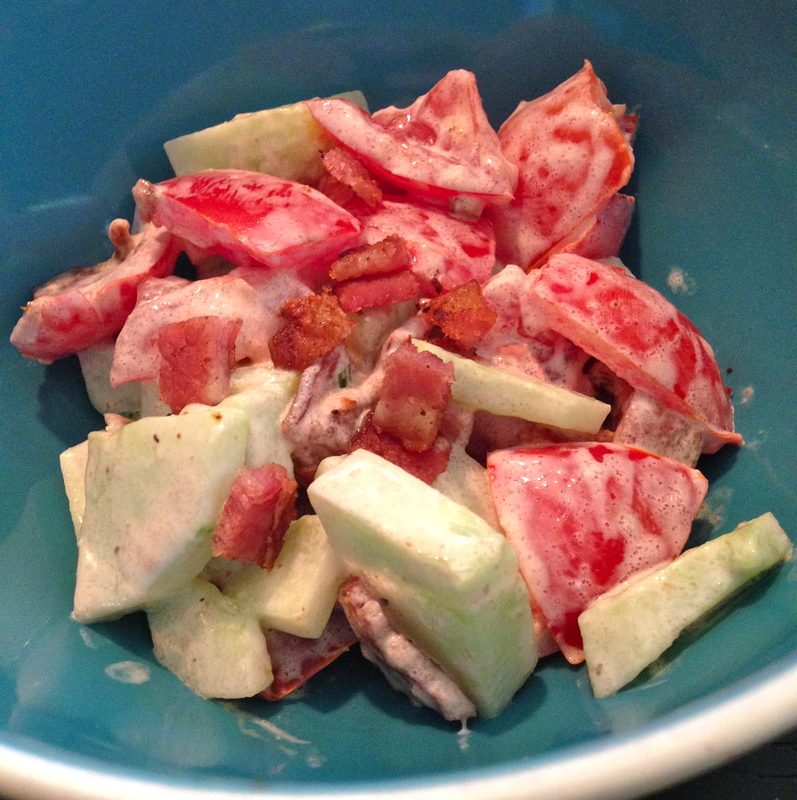 So I took the one non-pickling cucumber I had and a few of the many, many tomatoes and made this Bacon Tomato Cucumber salad. I tweaked the recipe a little bit – I substituted 1/2 the mayo with greek yogurt and added a splash of champagne vinegar. This was SO easy to throw together and it was super delicious! It tasted like a BLT in a bowl. It gets soggy leftover, so only make as much as you want to eat. But again, it was so easy it was totally worth it. This will become a regular recipe for me. Joe loves Giardiniera and it’s not as abundantly available in MN as it is in Chicago (most people would recognize this as the hot pepper mixture that Potbelly’s uses on its sandwiches). And this was a great use for a few of the smaller quantity vegetables I had on hand. I used several of the chilis, a few of the carrots and some farmers market cauliflower I had in the freezer. 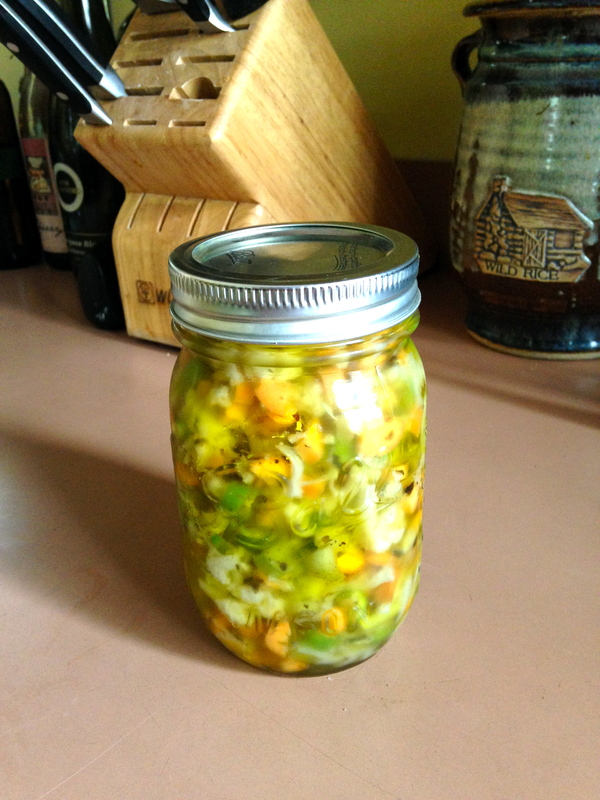 The recipe calls for 4-8 serrano chilis, depending on how hot you want the giardiniera to be. I went with 6 targeting a medium heat and so far, I think it could stand to be hotter. I started the process 48 hours ago, so it still may gain heat as it sits. It is a couple day process to make, but is not very labor intensive. It turned out pretty well and I expect it to get better and better as it marinades. Final product: this yielded about 1 2/3 pint jars, though I didn’t use an entire bell pepper like the recipe called for, so this could easily yield 2 full pint jars. 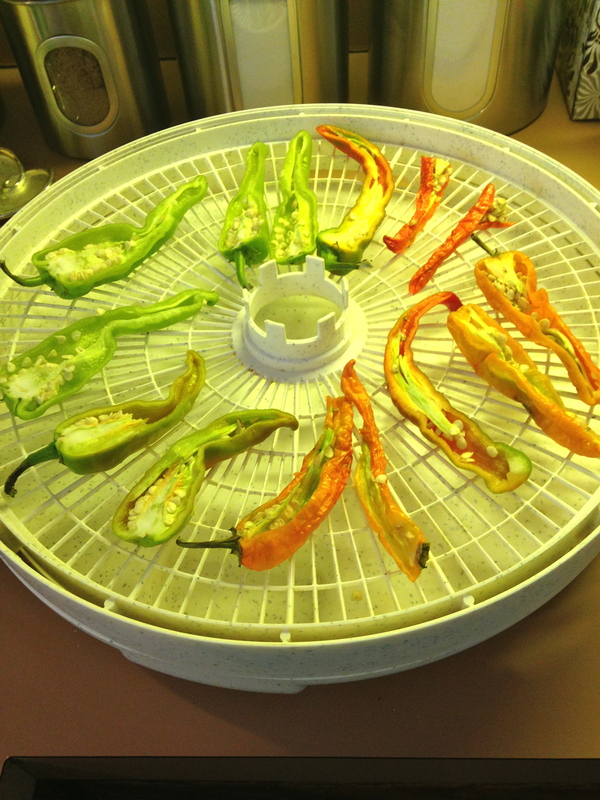 There were seriously so many chilis…..so I decided to cut several in half and stick them in the food dehydrator. It took about 24 hours at 100 degrees to dry these out. 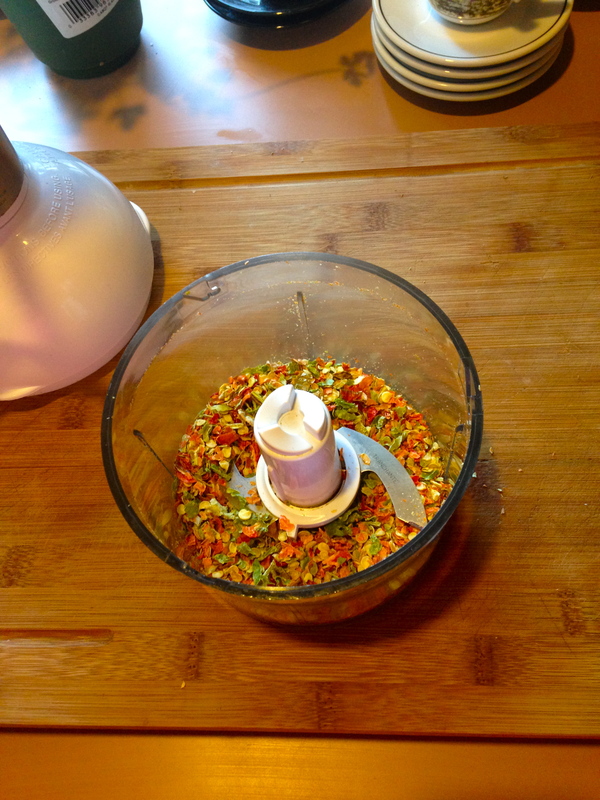 Once dried, I put them in my mini food processor and made homemade chili flakes. I kept all the seeds in the mixture, so I’m expecting these to pack a good punch of heat. These are now sitting in a dish next to my stove ready to be used for general cooking. I used the rest of the carrots and some onions from my brother’s garden and some farmers market kale to make one of my favorite healthy soups. This dish has a such a warm, spicy flavor – it’s very comforting. Yet it is packed with super healthy ingredients, so I love to have this in the freezer for whenever I am in need of something light and nutritious. 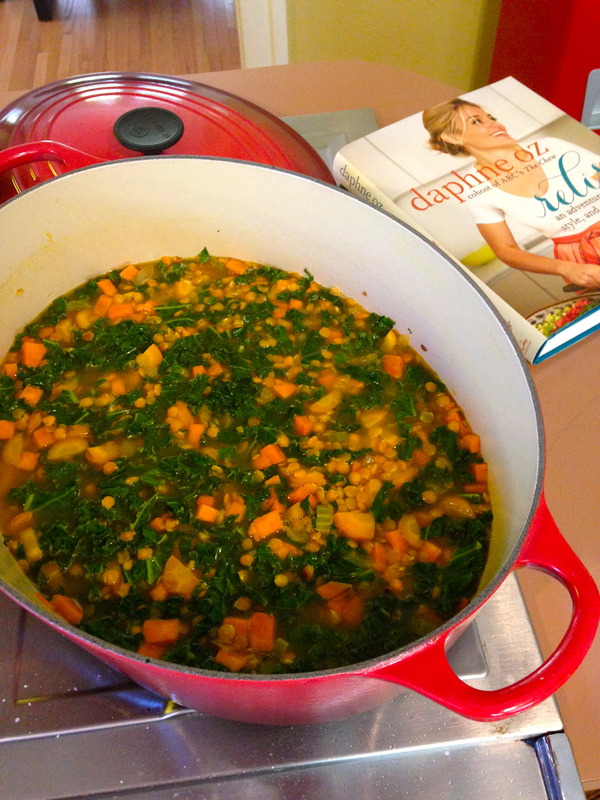 This is a Daphne Oz recipe and can be found both online and in her cookbook, Relish. So. Much. Zucchini. My brother had several monster zucchinis from his garden and I’m growing zucchini in my back yard as well. So I had to think of a few ways to use these. 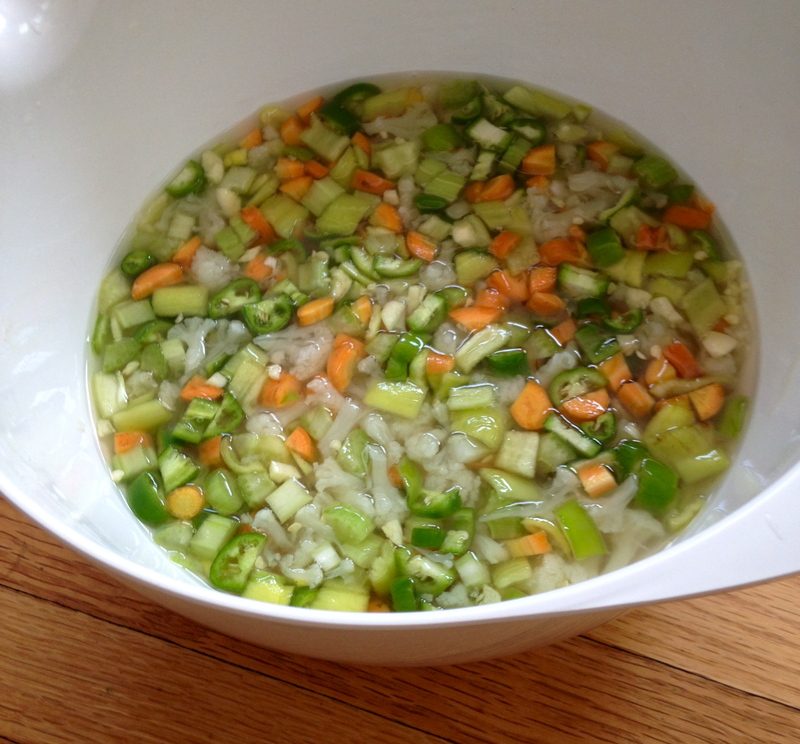 First, I simply grated several of the zucchini in my food processor to freeze. 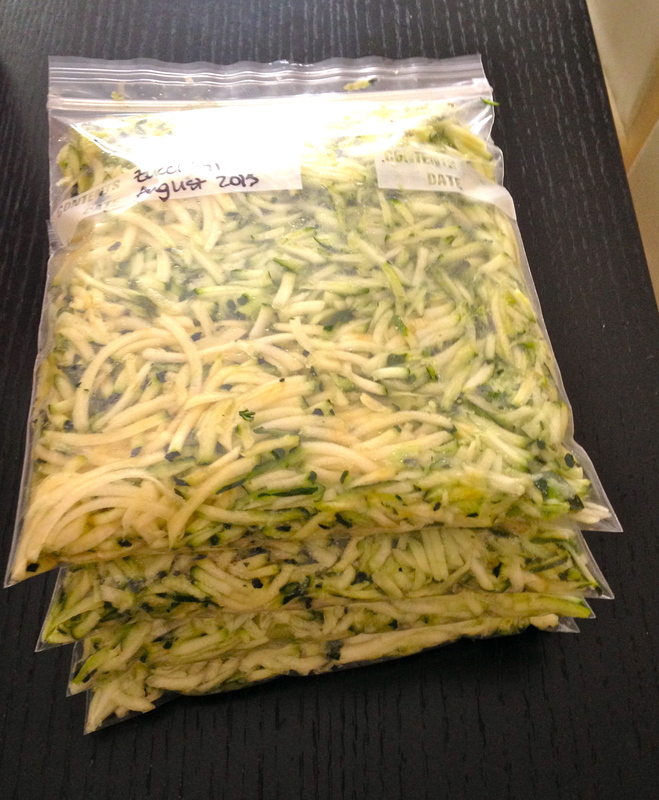 So I’ll have zucchini on hand to easily use all winter. I’m not much of a baker, but I may have to take a stab at zucchini bread one of these days. I searched for a lot of ideas of how to use/preserve so much zucchini. I came across a lot of pickle recipes, but because I was making so many pickles already, I wanted to find something a little different. 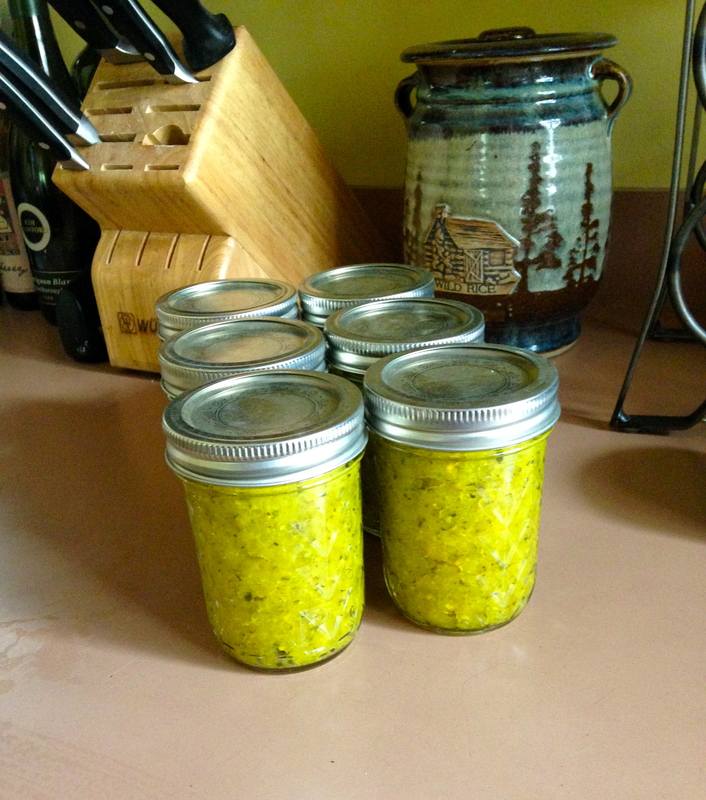 Finally, I found this summer squash relish recipe. Tasting it on its own, it’s not my favorite. But I have already mixed with a little mayo and greek yogurt to make a tartar sauce and I mixed it with mayo and ketchup to make a Thousand Island-type dressing for sandwiches. Both applications turned out quite tasty! 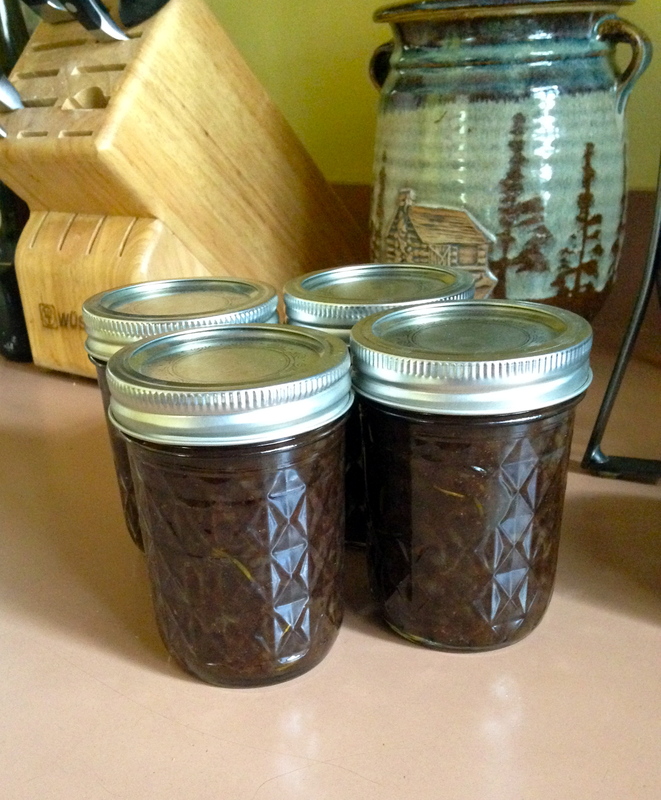 This recipe yielded a LOT, so I will have to get creative to use it (and will be giving several jars away – with ideas of what to do with it). Final product (this yielded 8 jelly jars and a pint in total). 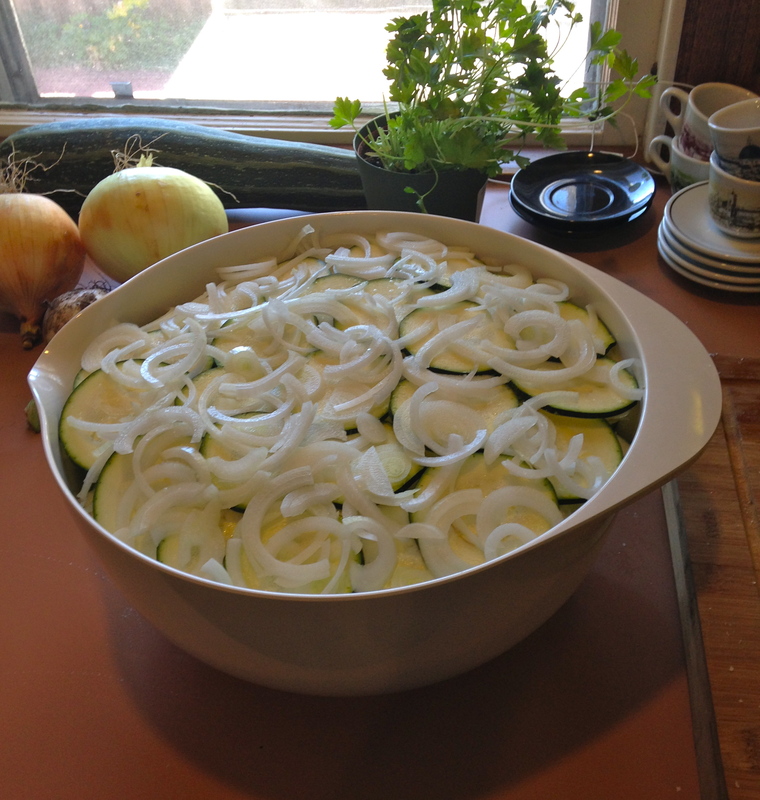 As I mentioned earlier, I got 8 lbs of pickling cucumbers from my brother. And I inherited a TON of dill in my backyard garden from the previous owner. 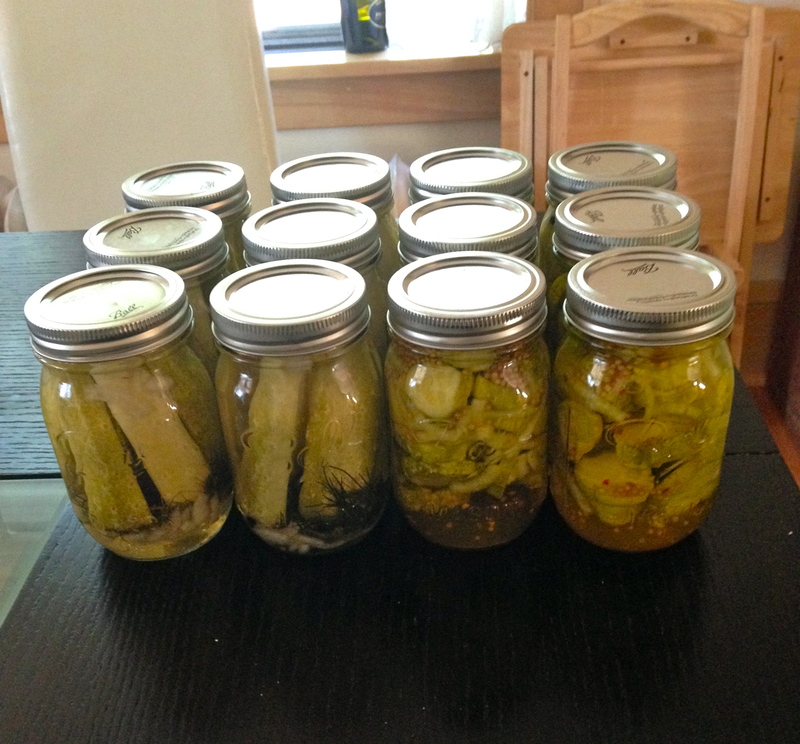 So I made two types of pickles: spicy dill (pictured left) and sweet and spicy pickles (pictured right). I have never made pickles before and they need to sit at least 2-3 weeks to come to flavor, so I have no idea if these turned out yet. I’m excited to try them! I saved the best for last!! To use onions from my brother’s garden and from the farmers market and to use rosemary from my back yard, I decided to try this recipe which is essentially like an onion jam. It is SO GOOD! One small bite is packed with flavor and is both sweet and savory. I tried this on some cheese and it was heavenly. I know this will be great on steak as well, and I look forward to finding other ways to use it. I highly recommend this recipe! Jars of gold! This recipe yielded 4 jelly jars. Here is the full line-up of canned items. I’m very excited to share these with loved ones and enjoy these throughout the fall and winter!